IG: @damien__mitchell, “Anti-Social Media” seen at local Williamsburg bar, The Levee. I was walking to work when I saw a heroin addict. The man was petrified in mid-act — bearing his teeth, arm outstretched, ready to use. Except, there was no needle, but rather, it was his phone injecting intravenously. He is slightly off-centered and hunched in the foreground of a wall with all the incumbent players vying for our attention. We see his face illuminated by the empty warmth of his LCD screen with the title “Anti-Social Media” sprayed adjacent to the artist’s tag in the upper righthand corner. It is a beautiful mural. After being moved by the piece, we decided to reach out to the artist, Damien Mitchell. He was kind enough to answer our questions. Check out what he has to say below. My name is Damien Mitchell. I’m from Wagga Wagga, Australia and I like to paint pictures on walls. What is your main inspiration for your artwork? Inspiration comes from all over the place. Sometimes my work is pretty, sometimes it’s political and sometimes it’s making a stupid joke. I like to keep my work varied, so I don’t get tired of painting the same thing. At the moment, I’m on the road so things like maps and transport schedules are handy to have. It’s also nice to keep in touch with people in other parts of the world that you wouldn’t get to see as often as you like. I try and spend as little time as possible on my phone and try to see it as a tool rather than entertainment. In the past, I’ve spent hours mindlessly flipping through social media and always come away feeling a bit unfulfilled. 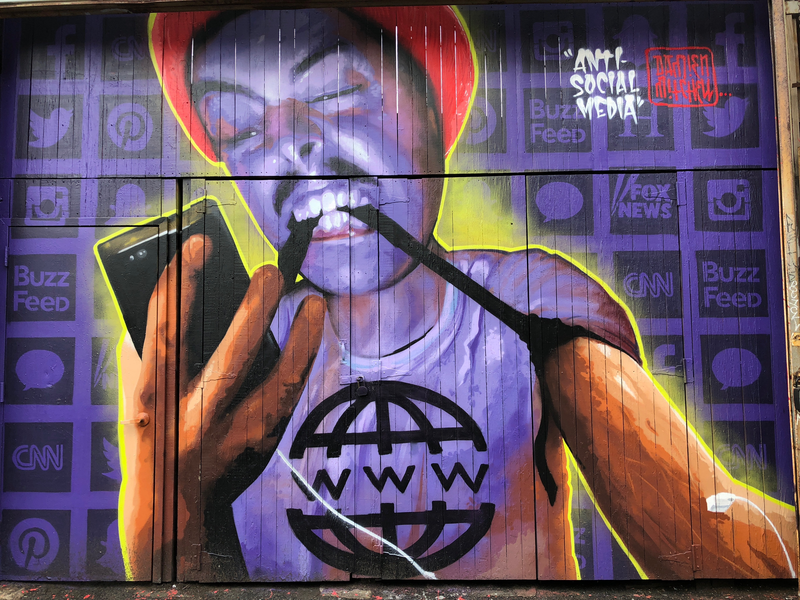 Tell us the thought process behind the “Anti-Social Media” mural. This wall is painted in Williamsburg, Brooklyn at The Levee. I had painted this wall [type mural] a couple of times before, the most recent being a comment on Donald Trump’s election “win.” It got some internet attention and I started seeing more and more selfies in front of it. I thought this deserved some kind of comment as well. I try to keep Facebook more for keeping up with friends around the world. The messaging feature is helpful in that a lot of people I know use it. I use Instagram more as a public sketchbook, with pieces, drawings, ideas and inspiration. I don’t use Twitter or Snapchat. I think they’re for teenagers and the president. How do you feel social media affects society? It has changed the way a lot of people interact. In my experience, it’s both made the world feel smaller, but also made me feel more insulated from it. It would be naive for me to say that social media platforms haven’t helped my art reach more eyeballs. Though, I have noticed some artists creating work primarily for internet love. Sometimes trading quality of concept for the instant gratification. I like to paint with the same intent I started with; for the random passerby to discover. A lot of street work loses context when viewed on screens. Do you take time out of your day or throughout your life to “unplug”? I don’t really like looking at screens. If anything I feel obligated to “plug in” to keep some online presence going. Kind of like a Tamagotchi that eats murals. Go outside, travel, talk to new people and try new things. I’d much prefer to eat a bad meal than read about someone else having a good one. I feel I should probably point out that my wall was in no way sponsored, inspired by or associated with BOLDFISH or anyone except the bar I painted it on.